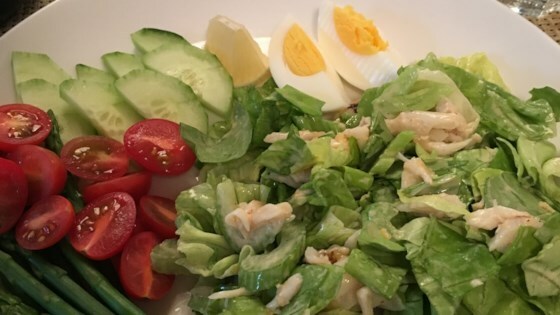 "This is a variation of the classic salad. Get your hands on the freshest Dungeness crab possible. It takes a little time to put this salad together, but for an elegant lunch it really pays off!" Bring a large pot of lightly salted water to a boil. Add asparagus and cook until tender, 2 to 3 minutes. Remove asparagus and and immediately immerse in ice water for several minutes to stop the cooking process. Pat dry. Whisk mayonnaise, lemon juice, ketchup, relish, Worcestershire sauce, chili powder, paprika, cayenne pepper, salt, and black pepper together in a small bowl to make the dressing. Toss crabmeat, lettuce, cucumber, and celery together in a large bowl with dressing to taste. Pile salad mixture evenly onto 4 plates; add equal portions of asparagus, avocado, tomatoes, and eggs. Garnish with lemon wedges.